I was feeling bored the other day so I thought I’d watch a movie to pass the time. Something light, maybe even cheerful, so when I came across an older children’s movie with a cartoon rabbit on the cover, I figured it would fit the bill. What could be more cheerful and light hearted than happy bunnies right? Boy was I wrong! 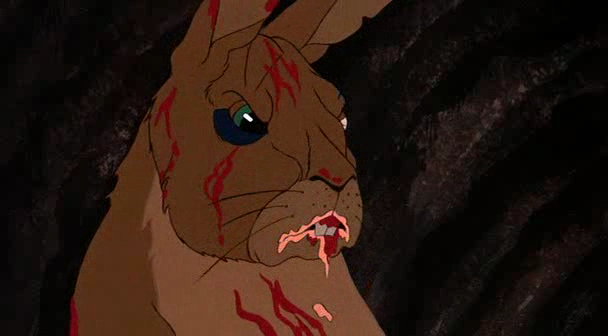 The movie is called “Watership Down”. Not a particularly descriptive name, especially since they never actually mention the name in the movie. 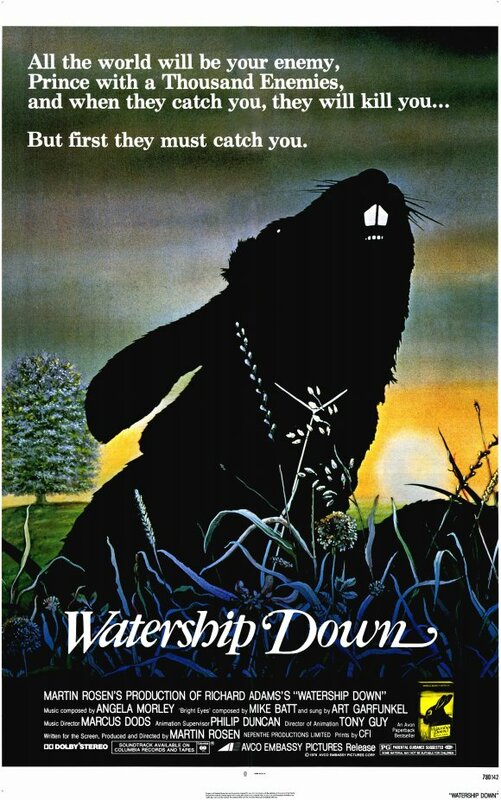 Apparently, Watership Down started as a book by Richard Adams, and was later adapted to an animated film in 1978. I suppose my first clue as to how this movie would be should have been the tag line on the cover; “All the world will be your enemy. Prince with a thousand enemies. And when they catch you, they will kill you… But first, they must catch you.” That’s pretty heavy stuff for a kid’s flick huh? The movie starts out with a typical 70’s style of animation showing how the world of the animals were created. This story has it’s own god figure, and it’s own parables and unique mythology scattered throughout the movie, so this beginning stage is very important to understanding the rest of the movie. The main things they talk about in the beginning is how “Frith” (the god figure, represented by the sun) created all the animals in the world the same, and they all ate grass. But, because the rabbits ate too much of the grass, Frith gave gifts to the other animals to allow them to eat the rabbits to keep them under control. That’s where things start to get a little gruesome. So, after being chased around for a while with all his people getting eaten, it’s now the rabbit’s turn to receive a gift, but because he’s scared now, he turns his back on Frith and tells him that if he wants to bless anything, he’ll have to bless his back side, and so Frith gives the rabbits powerful legs to jump and run faster than their predators. Not much of a gift but Frith promises the rabbits that they will always be allowed to thrive so long as they can out smart and out run their enemies. After that brief introduction, we cut to the actual story where we’re introduced to the main characters, Hazel and his brother Fiver. Fiver is the runt of the litter, and is also a psychic (he sees visions), but seems like he displays many symptoms of mental illness and is quite paranoid and prone to very disturbing fits. After some small talk, Fiver sees his first vision, the field they live in filling up with blood and all the other rabbits dying a horrible death. We’re not even ten minutes into this movie and already I’m imagining children watching this getting wide eyed and having nightmares. The scene reminded me of the part in “The Shining” where the kid sees a vision of the elevator doors opening and the hallway filling up with blood. Anyway, that sets the rabbits on a journey to find a safer place to live. The journey, however, is anything but safe. Each time they try to get anywhere, more trouble befalls them, and many rabbits perish along the way. What strikes me is how graphic the scenes are. You remember in most children’s movies when a character dies, it’s usually off camera? You get a cut scene, and usually a sound effect to tell you what happened. Not in this movie. There are very few exceptions. One that comes to mind is when the rabbits are resting in a corn field and “Violet” goes just a little too far to get something to eat. We see a hawk flying overhead, then a close up of the hawk’s talons as it swoops down, then a cut scene with a “thud” sound effect, and then the spot where poor Violet was with nothing left but a tuft of fur left blowing in the breeze. You think you’ll get lucky with the next death scene as one of the rabbits run into a bush and you hear a “choking” sound like he’s caught in a snare… But then they show the rabbit caught with a snare around his neck as the others try desperately to get him out. The scene seems to go on and on as eventually the rabbit starts to cough up blood and even after the other rabbits free him, he appears to die. The other rabbits stand around his bloodied body and say a prayer for their fallen friend. This is one of the most gruesome death scenes I’ve ever seen in a cartoon. Luckily, the rabbit doesn’t actually die, he gets up a few minutes later, apparently he was only knocked out. This is one of the very few times in this movie where you think a character has died, but they actually make it. Most times here, it’s permanent. They move on, and other bloody, gory, and terrifying scenes follow quickly as they meet up with one of the rabbits that didn’t leave the field with the main group. He’s almost dead, and tells them that the vision Fiver had was right, the field was bull dozed for development and they don’t hesitate to show rabbit burrows clogged with dead and dying rabbits as he tells the tale. This theme continues through the rest of the movie with rabbits dying one by one in the most horrible and disturbing ways. There’s even some mild cursing. One thing is for sure, this ain’t Disney. There’s not enough room here for me to describe all the deaths in this movie, so I’ll just jump to the one that people remember the most. Probably the saddest moments I’ve seen in any movie, let alone a cartoon. The end of the movie, the main characters have made it to a safe place to live and they are prospering. In my mind, this is where the movie should have ended. And they all lived, happily ever after… But, alas, it’s not to be. We see Hazel, now a very old rabbit, wandering away from the family group to graze. Then, he hears a voice, it’s the voice of the “black rabbit” (the grim reaper of the rabbit world). “So leaving his friends and no-longer-needed body behind, Hazel departs Watership Down, slipping away, running easily down through the wood where the first primroses were beginning to bloom.” This is shown by the rabbit’s body slumping over and his transparent spirit getting up and following the Black Rabbit away. Now that everyone who saw the movie is in tears, I’ll move on with the review. I know in days past, cartoons were supposed to teach children something, and many cartoons taught children about death. However, I’ve never seen one quite so graphic or heart wrenching as this. Many people (like me) would say that this is in no way a children’s movie. Given the complexity of the situations and constant loss of life and mutilation in very dramatic fashion, there’s no way I could recommend this film for children. Now, it’s fine to explore the topic of death in a cartoon, but I really think they should have let the audience experience it in an easier way. But what could let you down easier than dealing with it by using fluffy cartoon bunnies? I suppose I see both sides of the equation, but the graphic nature of the film was more harsh than watching real life events on the Discovery Channel. Far from a light hearted experience, this film left me in somewhat of a somber stupor while I contemplated the meaning of it all. Do you think when the folks drawing this were depicting a rabbit dying in a snare with blood gurgling from his mouth that even one of them thought “hey, do you think this will freak kids out”? I can’t imagine anyone bringing up the question and then deciding that it was just fine. I suppose, that even though we may be prepared for facing our own mortality, there really is no preparing for facing the mortality of loved ones. And this movie brings that to the surface in shocking fashion. This movie is harsh because life is harsh and the harshest part of life is when it comes to an end. Ignorance is bliss, but that’s why children are happy, because they’re ignorant of all the perils of the world and how it can all fall apart. This movie removes that innocence. Other than the constant and terrifying deaths, this movie is quite epic. The story is complex, the rabbits have their own caste system, religion, and even their own language. The story is one of searching for a safe place to live free. To endure hardship and trials so that those who come after you will have a better life. So if it wasn’t for being scarred for life, nightmares of mangled bunnies, or losing your innocence and being scared shitless of horrible deaths, then the movie would be a masterpiece. One thing is for sure, it certainly leaves an impact on those who watch it. If you’re looking for a light hearted or inspirational film, look elsewhere. Black Hawk Down will be more likely to give you that than Watership Down.